Governor Jim Justice’s FY 2020 budget includes new spending initiatives and pay raises while avoiding spending cuts as the state’s financial situation shows signs of stability. While the FY 2020 budget is an improvement after years of budget cuts, it represents a missed opportunity to reverse the damage of past mistakes and invest in a future shared prosperity. Read PDF of report. 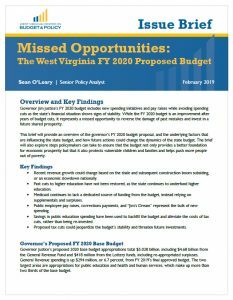 This brief will provide an overview of the governor’s FY 2020 budget proposal, and the underlying factors that are influencing the state budget, and how future actions could change the dynamics of the state budget. The brief will also explore steps policymakers can take to ensure that the budget not only provides a better foundation for economic prosperity but that it also protects vulnerable children and families and helps push more people out of poverty. Recent revenue growth could change based on the shale and subsequent construction boom subsiding, or an economic slowdown nationally. Past cuts to higher education have not been restored, as the state continues to underfund higher education. Medicaid continues to lack a dedicated source of funding from the budget, instead relying on supplementals and surpluses. Public employee pay raises, corrections payments, and “Jim’s Dream” represent the bulk of new spending. Savings in public education spending have been used to backfill the budget and alleviate the costs of tax cuts, rather than being re-invested. Proposed tax cuts could jeopardize the budget’s stability and threaten future investments.